Sometimes I wish I could wave a magic wand over a particularly wonderful medieval design and suddenly have a fully-graphed, beautifully-colored chart appear, ready for stitching. Alas, it doesn't work that way. There are actually 5 to 6 steps involved in the process. Step 1 is the fun step which involves looking through many books for possible pattern sources. These can be books on medieval manuscripts or archaeological excavations or even generic history books along the line of "the Anglo-Saxons in England". 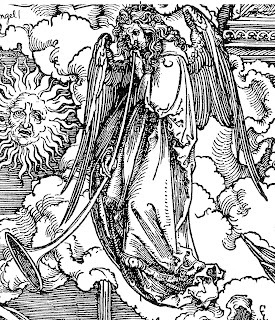 Here, for example, is a detail from a print by Albrecht Duerer, done ca. 1496-97, titled "The Seven Trumpets" (The Apocalypse). Step 2 involves making a line drawing of the basic lines of the design. I first enlarge the detail as much as possible, then trace it onto white paper on a light table. Step 3 is where the line drawing is transformed into a rough graph. I take the line drawing and scan it into the computer. 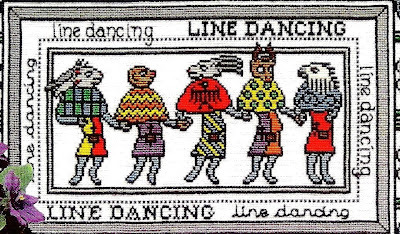 Then, using PatternMaker by HobbyWare (a very good software program for stitchers), I import the line drawing. This is not as easy as it sounds! Many attempts are usually needed, using different size parameters, to get the design where the smaller details can be done clearly. Fingers, toes, faces, and wings are the hardest to get correct. Step 4 is where most of the hard work takes place. Although it is difficult to see above, the rough chart is made up of many close shades of greys. Lines are not yet clearly defined. It takes literally hours and hours to refine the rough chart and then to add all the details that bring it as close to the original as possible, or at least to give the feeling of the original. With a complicated design such as this, it is impossible to get Duerer's fineness of line, but I try to approximate it. Step 5 is another fun step. I get out my skeins of the entire DMC line of floss and "color inside the lines". Medieval illuminations were done in exactly the same way -- outline first, color second -- so I feel I'm following at least the correct sequence. It is always intriguing to me how changing the shade of a color, even by one very small degree, can made such a dramatic difference in the overall effect of the piece. In this case, primary colors worked best, although stitchers are always encouraged to make their own color choices if they'd prefer. 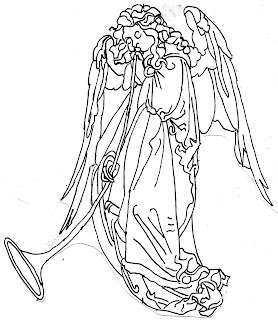 Also, in this particular design, I would encourage the use of silver and gold filament threads with the whites of the wings and the yellow of the trumpet to give it a slight sparkle. Step 6 is the icing on the cake, adding the border. Not every design needs one, but it is amazing what a perfect border can do to the overall design. This, in itself, can be very time-consuming as not only does the border have to have the right proportions compared with the main element(s) of the design, but it has to be centered around the design in a way that balances the whole impression. And voila! Duerer's trumpeting angel is now ready for stitching. I seem to love things with wings: dragons, griffins, harpies, for example, and, of course, angels. 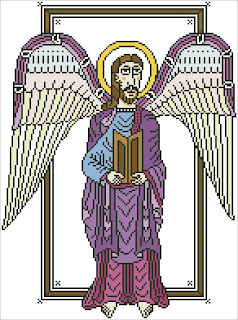 As a cross-stitch designer, it has been difficult finding medieval and Renaissance angels that are small enough or not too complicated so that they can be charted and still look reasonably angelic. And all those feathers ... oy vey! There are big angels and small angels, serious angels and joyful angels. But no matter their personalities, they are a very old, very important aspect of many of the world's religions. "From the earliest times, the smiling cherubim, those chubby little aeronauts, have been especially admired," says Giles Neret. "In the most ancient cosmogonies, Cupid was considered the god of creation, born of primitive chaos and one of the primordial elements of this world. The Greeks called him Eros; he presided over marriages and victories, and from the 6th century BC onwards, he was perceived as the intermediary between gods and humankind ... ." This sweet cherub riding a siren comes from a 16th-century French manuscript. Hebrew culture and religion were influenced by contacts with the Babylonian and Egyptian worlds where they were exposed to such creatures as winged genie and protector goddess with wings. The biblical iconography of an angel was a being born a male. The apocryphal book of Enoch says that angels fell in love with the daughters of men. 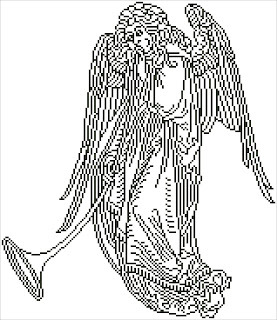 This male angel (whom I call "Luigi da Angel") comes from an 11th-century French manuscript. Islamic angels were strictly male; this depiction of the Archangel Gabriel was painted in Egypt or Syria in the 14th century. However, most western angels were considered sexless and ageless. They were, interestingly enough, wingless until the 4th century AD. John Chrysostom explained it thus: "They [the wings] manifest a nature's sublimity. 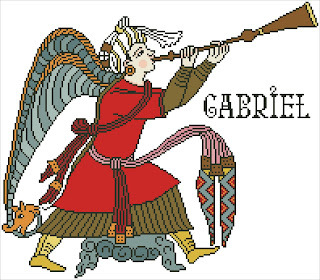 That is why Gabriel is represented with wings. Not that angels have wings, but that you may know that they leave the heights and the most elevated dwelling to approach human nature. Accordingly, the wings attributed to these powers have no other meaning than to indicate the sublimity of their nature. This little Spanish angel looks like it doesn't quite know what its job might be, let along what order it might call home! It wasn't until the Renaissance that the glorious angels we all now think of as quintessencially "angelic", with their brilliant and powerful wings, their flowing and sumptuous robes, their curly blond hair, their "angelic" expressions -- those stunningly beautiful creatures painted by Fra Angelico and others -- appeared. 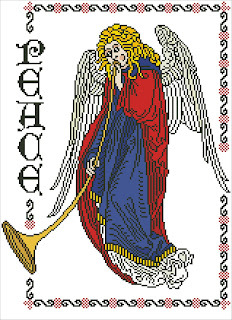 This musical angel is powerful, a creature to be reckoned with, to be revered, to be placated, to be honored, to be noticed. 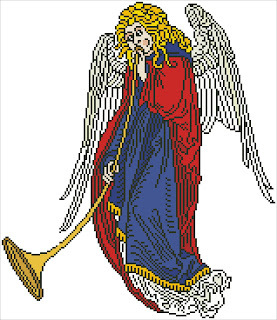 This beautiful angel blowing its horn is from a 15th-century print by Durer. In my next blog, I will talk about the process of taking a Renaissance print of an angel and turning it into a chart for stitching. But until then, may I recommend some good sources for information on angels? Barker, Margaret. An Extraordinary Gathering of Angels. MQ Publications, 2004. Bussagli, Marco. Angels. Abrams, 2006. Neret, Gilles. Angels. Taschen, 2003. Zuffi, Stefano. Angels and Demons in Art. J. Paul Getty Museum, 2005. Droll adj. amusingly odd or whimsically comical. That certainly sums up those strange little creatures that inhabit the margins of medieval illuminated manuscripts. Sometimes called grotesques or hybrids, drolleries were mixed-up characters, such as an animal and a human, an animal and a plant, or two different animals. This little fellow to the left is from the 13th/14th century Ormesby Psalter done in England. Margot Nishimura, in her book, Images in the Margins, talks about "marginalia", those images or words placed in the margins of manuscripts that were designed by the medieval artist to fill out a page of text with pertinent or simply whimsical illustrations. She says, "Unpredictable, topical, and often irreverent, like the New Yorker cartoons of today, marginalia must have been a great delight for medieval readers." Popular especially in French, English, and Italian manuscripts of the Gothic era (13th to 15th centuries), what is particularly surprising is that these droll marginalia appeared most often and in the greatest number in books of Christian worship. As Nishimura goes on to state, "the images in the margins betray a culture surprisingly at ease with the mingling of the sacred and the profane." But even stranger is the fact that "no one explanation satisfies our desire to find meaning in these out-of-the-way and sometimes ribald images." This odd elephant-bird comes from a 14th-century French manuscript, the Smithfield Decretals, that was illustrated in England. M.M. Bakhtin, in his book, Rabelais and His World, says "The men of the Middle Ages participated in two lives: the official and the carnival life. Two aspects of the world, the serious and the laughing aspect, co-existed in their consciousness. This co-existence was strikingly reflected in ... illuminated manuscripts ... Here we find on the same page strictly pious illustrations ... as well as free designs not connected with the story. 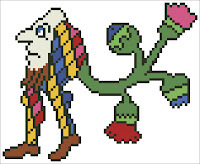 The free designs represent chimeras (fantastic forms combinging human, animal, and vegetable elements), comic devils, jugglers performing acrobatic tricks, masquerade figures, and parodical scenes -- that is, purely grotesque carnivalesque themes ..." This particular drollery comes from a 14th century French manuscript, Decretum by Gratian. We are already familiar with many drolleries: the dragon, the griffin, the harpy, the sphynx, the wyvern, the winged horse. 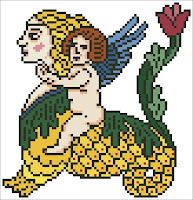 These are creatures known to us from childhood stories of castles and fair maidens and heroic knights and exotic lands. But then there are the ones, such as this 5th-century Roman creature, that are just a bit more extraordinary, a bit stranger with its combination of horse, fish, and bird. For further reading about drolleries and marginalia in medieval manuscripts, I recommend the following books. Bovey, Alixe. 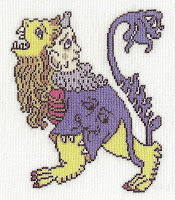 Monsters and Grotesques in Medieval Manuscripts. University of Toronto Press, 2002. Camille, Michael. Image on the Edge: The Margins of Medieval Art. Harvard University Press, 1992. Jones, Malcolm. The Secret Middle Ages. Sutton Publishing, 2002. Morrison, Elizabeth. Beasts Factual & Fantastic. The J. Paul Getty Museum and The British Library, 2007. Nishimura, Margot. Images in the Margins. The J. Paul Getty Museum and The British Library, 2009. Rabbits, both wild and domestic, positively litter medieval illuminations. They seem to have grabbed the imagination of the artists to a far greater extent than any other animal. Rabbits could be shown almost lifelike, as in this Durer example. 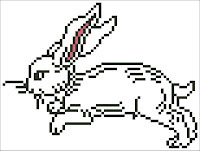 Rabbits - "mad as a March hare" -- were often shown gambolling about the place. Sometimes they were just silly and took on humanoid personalities. 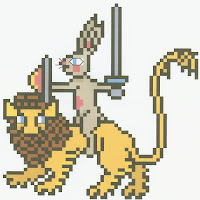 Then again, rabbits could be brave, stalwart, and heroic. 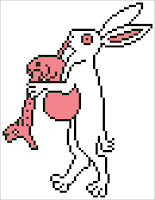 And finally, rabbits could be just out-and-out drolleries. I'll talk about drolleries in my next blog. When I was twelve years old, I got my own bedroom and promptly put posters of German castles on the walls. Maybe it was the early childhood influence of reading all the red, green, and blue books of fairy tales, but many years later Arelate Studio was born. It is amazing to spend each day knee-deep in medieval and Renaissance sources which I use as inspiration for my cross stitch designs and formal research. And what is "Arelate", you may well ask? One day in 1999, my editor called and said I needed to immediately find a name for "me" to use on my first book, "Ecclesiastical Pomp". I was studying the Merovingians (one of the Germanic tribes that invaded Europe) at the time, and had just read that "Arelate" was the old Roman name for the city of Arles in France. Et voila! It is pronounced "air-eh-la-teh" although most of the time it comes out sounding like coffee with milk. "Wyvern" is a curious word, isn't it? 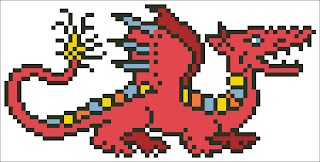 It comes from the Middle English word, wyvere, viper, and is a two-legged dragon having wings and a barbed and knotted tail. 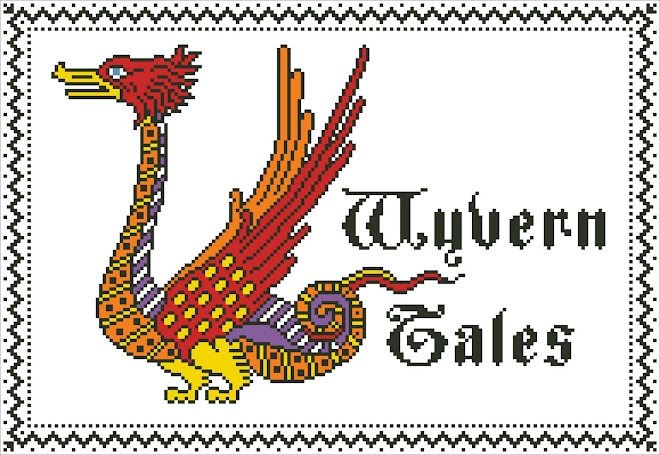 A most handsome wyvern ornaments the title block above. This small fellow above is a dragon. Most of the "dragons" you see in medieval and Renaissance art are actually wyverns! A dragon is officially a giant, four-legged reptile with wings, the claws of a lion, the tail of a serpent, and a scaly skin. This fierce little beastie undoubtedly has the heart of a dragon if not the size! Welcome to this wondrous, wild, and weird world of the medieval and Renaissance imagination!